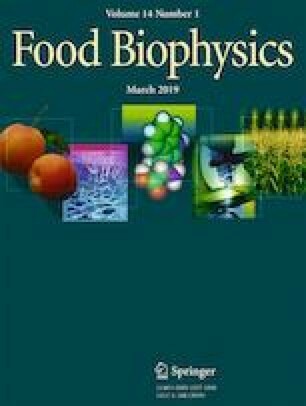 Physical and textural properties of mayonnaise prepared using virgin coconut oil (VCO)/fish oil (FO) blends at different ratios were examined in comparison with that prepared using soybean oil (SO) as affected by storage time (30 days). At day 0, sample prepared with SO showed the highest L*, a*, and b* values among all the samples, whereas the lowest values were noticeable for VCO containing sample. At day 30 of storage, decreases in L*, and b* values of all mayonnaise samples were observed (p < 0.05). However, a* values were increased at day 30 of storage (p < 0.05). For texture analysis, highest firmness, consistency and cohesiveness were obtained for the sample containing SO. Increasing levels of FO in VCO/FO samples increased the firmness, consistency and cohesiveness. For all the samples, loss modulus (G″) values were lower than G′. After 30 days of storage, all samples demonstrated slight decreases in G′ and viscosity than freshly prepared mayonnaise (day 0). When the sample containing VCO/FO (90:10) blend was further characterized, slight difference was observed in microscopic structure and droplet size distribution before and after storage of 30 days. Increase in droplet size was noticeable because of coalescence after the storage. Overall, type of oil used for preparation of mayonnaise as well as storage time affected the physical properties including textural and rheological properties of mayonnaise. This work was supported by the Thailand’s Education Hub for Southern Region of ASEAN Countries (TEH-AC, 2015) scholarship.